J. Grzywacz, E. Demerouti, Introduction and Overview. G. Spreitzer, Using A Positive Organizational Scholarship Lens to Enrich Research on Work-Family Relationships. 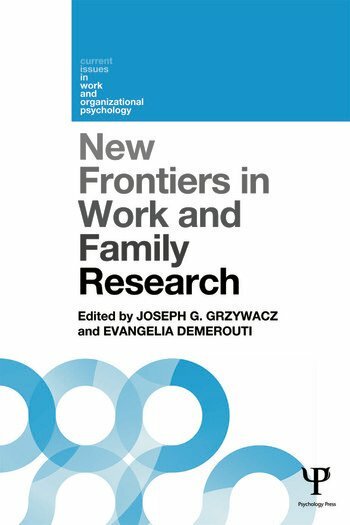 S. Macdermid, L. Hibel, A System Perspective on Work And Family. E. Demerouti, I.M. Corts, M. Boz, A Closer Look at Key Concepts of Work-Nonwork Interface. A.B. Bakker, E. Demerouti, The Spillover–Crossover Model. S. Sonnentag, I. Braun, Not Always a Sweet Home: Family and Job Responsibilities Constrain Recovery Processes. J.G. Grzywacz, D.S. Carlson, B.A. Reboussin, A Primer on Sampling. A. Butler, Z. Song, R. Ilies, Experience Sampling Methods for Work-Family Research: A Review and Research Agenda. F.T. Amstad, N.K. Semmer, Chains of Events in Work-Family Research. O. Buxton, L.C. Klein, S. Williams, T. McDade, Biomarkers in Work and Family Research. R.L. Repetti, S.W. Wang, M.S. Sears, Using Direct Observational Methods to Study the Real Lives of Families: Advantages, Complexities, and Conceptual and Practical Considerations. M.C.W. Peeters, L.L. Ten Brummelhuis, E.F. Van Steenbergen, Consequences of Combining Work and Family Roles: A Closer Look at Cross-Domain Versus Within-Domain Relations. Joseph G. Grzywacz is Kaiser Family Endowed Professor of Family Resilience at Oklahoma State University, USA. He is an interdisciplinary social scientist whose research focuses on the health-related implications of everyday work and family life for adults and children. His research emphasizes the role of work and family in creating and exaggerating health disparities, and programmatic and policy solutions for eliminating forced choices between work and family. Evangelia Demerouti is a full-time professor at Eindhoven University of Technology, the Netherlands. Her research focuses on the processes enabling performance, including the effects of work characteristics, decision making, occupational well-being and work–life balance. Her articles have been published in journals including Journal of Applied Psychology, Journal of Occupational Health Psychology and Journal of Vocational Behavior.